With us, you have several options to choose from! 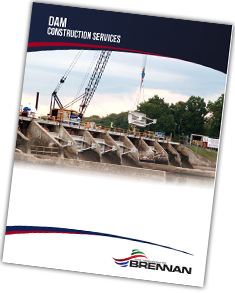 Traditional concrete repairs on dam structures must be carefully coordinated. Starting with the demolition process, material must be removed in a systematic process that will focus on crew safety and environmental preservation, while at the same time maximize efficiency. At Brennan, we have developed methods to capture debris and remove it safely from the dam structure. Surfaces are then cleaned and prepared to maximize bonding capabilities with new concrete. Placement can be carried out in a variety of methods, both above and below the waterline. From traditional placement, to specialty placement methods such as preplaced aggregate concrete, precast, leave in place formwork, and grouting. We build and assemble site specific formwork to match the contours of the structure. Concrete can either be pumped in, or delivered using marine equipment. 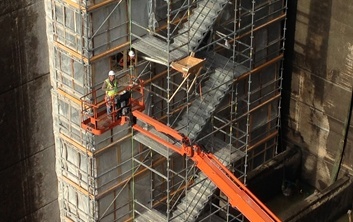 Either way, all quality control tests and procedures will be in place no matter how difficult site access may be. Throughout the construction process we will coordinate with our clients to minimize the impact of high water events, or flash floods. At Brennan, we work around the water in everything we do and have the systems and tools necessary to mitigate the associated risks. This includes preparation for unpredictable situations that may put our crews or the project in jeopardy. Want to know more about our concrete placement services? Fill our the form below!